Central Luzon, easy and quick to get to. With everything you could possibly need. 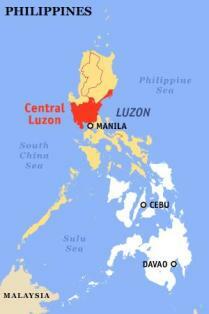 Central Luzon, as it sounds is the region in the central part of Luzon, passin directly throught he centre, from the Paific Ocean to the South China Sea. Central Luzon has been used by Filipinos from Manila as an area for stress relief from their busy lifestyles and work pressures. The region borders Manila, giving great access. Central Luzon has been an area where Americans and Europeans have both started enterprises and used the proximity to Manila and the international airports to full advantage. Aurora is picture perfect. From the Pacific Ocean, where the cliffs lunge into the ocean creating small beach filled bays, rising into the majestic jungle covered mountains of the Sierra Madre Mountain range, Aurora is beautiful! There is nothing more satisfying than sitting with your feet dipped in the crystal clear water below a cascading waterfall in the middle of jungle draped in tree ferns. Fantastic. Aurora is not without it's problems. It is being overlogged and over fished, with the obvious consequences. Nothing that cannot be fixed. Getting to Aurora through snaking roads and over the mountains in not for the faint hearted, but the views are spectacular! If you are into surfing then the capital of Aurora province, Baler is the spot you should go to. Have a look here for Baler Surfing ! Bataan has never been a huge tourist mecca, tending to be out of the way and is easily by passed by tourists heading further afield. This has been a blessing in disguise for Bataan, as the beaches are stll unspoilt and pristine. You would also enjoy a province rich in culture and history. Battan's border to the west is the South China Sea and to the south and east by Manila Bay. Getting to Bataan is an easy one hour ferry trip. Bulacan boasts that it is the province of heros, beautiful women and exquisite craftsmanship! Who could challenge them, you would have to be a brave person. If you ever wanted to feel the heart and soul of a country, mixed with culture, history and tradition, then Bulacan is the place you need to visit. Bulacan is now moving away from its agricultural roots and is becoming industrialised. It is seen as a good province to invest in commercial enterprises due to its easy accessibility to Manila. It is just a few minutes drive north of Manila. Nueva Ecija is the largest producer of rice in the region of Central Luzon. Due to the amount of rice it producers it is commonly known as the rice bowl of the Philippines. It is also the biggest province in the region. Nueva Ecija is an agricultural province and is not a tourist destination, it does have some deposits of minerals and it is said to have gold in the upper reaches of the Carranglan and Palyan. Pampanga is well known for its exotic culinary feasts, livid festivals and historical and cultural landmarks. If you enjoy outdoor activites, this is the place for mountain treking, hot air balooning and ultra light plane rides. In Easter be sure to see the re-enactment of the crucifixion of Christ. Pampanga can be found in the middle of Central Luzon and will take just over an hour to get here from Manila. Tarlac, is completley landlocked and consists predominantly pf plains with the remaining being mountains. Tourism has not relly been a big part of Tarlac although it does have some great historical areas, mouth watering cuisine, rice and sugar plantations and golf courses for those so inclined. Zambales is a most beautiful province stretched out along the west coast of Luzon. It has the South China Sea as a boundary on the west. Zambales is well know as a for its black sand beaches and blue warm seas. It has fantastic wreck diving along the coast including numerous wrecks at Subic Bay in the Olongopo area. For information on Subic Bay and the best way to get there, have a look here. Getting here by road will take three and half hours from Manila and is worth a trip. Everything you need you will find in Zambales in the Central Luzon Region.